Popcorn is one of America's favorite snack foods. Naturally low in fat and high in fiber, popcorn is simple to prepare and is inexpensive compared to other snack foods. Popcorn can be eaten as is or seasoned with salt, sugar, butter or other flavorings. Popcorn traces its roots back to antiquity, with the American Indian first introducing the treat to New World settlers. Popcorn is a specific strain, Zea mays averta, of flint corn that is primarily grown in the mid-west, with most grown in Indiana and Nebraska. Specialty breeds of popcorn have been developed in order for the popcorn to be popped in the microwave. Popcorn seeds can be purchased from many seed companies for the home grower, but commercial farms grow the majority of popcorn. The demand for popcorn rose significantly during the Great Depression and many farmers switched their crops from sweet corn to popcorn to keep up with the demand. Popcorn is planted much the same way as sweet corn. The ground is fertilized with nitrogen to insure the growth and production of the best possible corn ears. Unlike sweet corn, popcorn is allowed to mature and dry on the cornstalk. When the kernels are sufficiently dry, a harvesting combine is brought into the field to harvest the popcorn ears, removing the ears from the stalks. The husks protecting the kernels are then removed and the individual kernels are removed from the ears. The popcorn kernels are then sent to the processor for cleaning and packaging. Placing the kernels in a large screening system to shake off any graft, or husk portions, that may remain in the corn, does this. The kernels are then allowed to rest until the optimal moisture content for popping, around 13 to 14 percent, is achieved. The popcorn is then packaged, by machine, into bags or other containers that can be purchased at the grocery store. Popcorn should be stored in a cool, dry place in an airtight container. 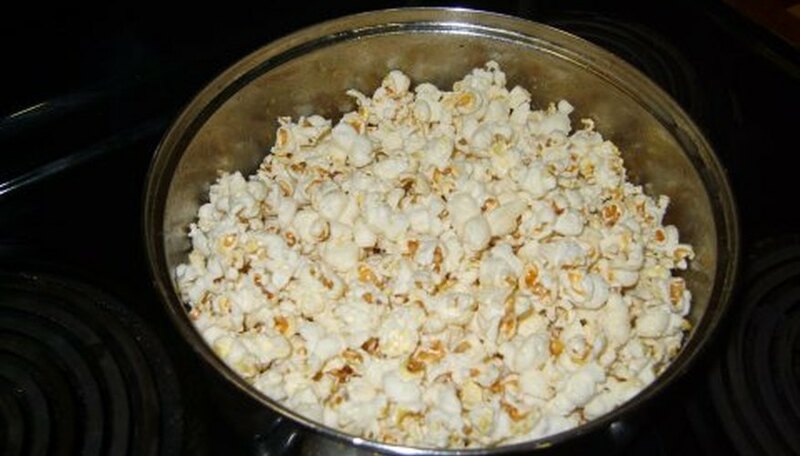 If the popcorn refuses to pop, the addition of a tablespoon of water to a quart of popcorn may remedy the issue. The FDA does not recommend popcorn as a snack for children under four because of chocking issues. New strains of popcorn are being developed that have no hulls when popped, which makes popcorn a treat for the whole family.